Ever tried Jellyfish soup? – snorkelling in it that is! 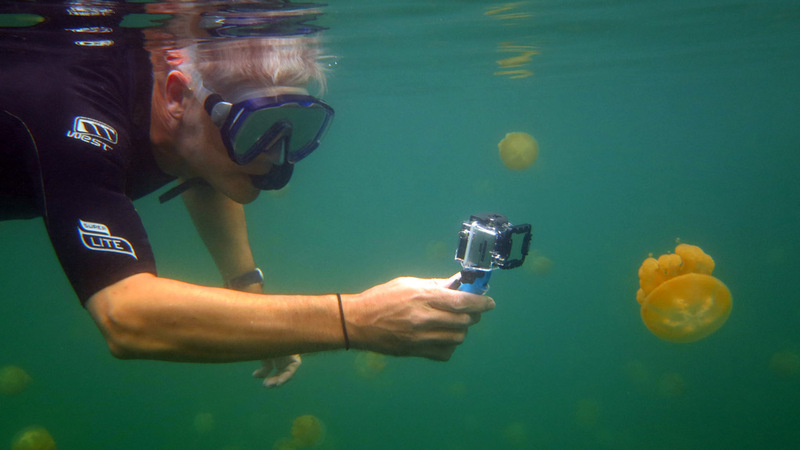 There is a lake in Palau full of jellyfish, which are completely harmless and you can snorkel amongst them. It’s a bit like snorkelling in a warm, green jellyfish soup. There is a lake in Palau full of jellyfish, which are completely harmless and you can snorkel amongst them. “How many jellyfish exactly?” seemed a fair question, but “Between six and twenty million” wasn’t the answer we were expecting from our otherwise precise and accurate dive guides Richard and Paul from Unique Dive Expeditions at Sam’s Tours. The next question was obviously ‘how?’ How does it happen that on one island of the small archipelago of Palau, in the middle the Pacific Ocean, in a completely enclosed lake, there lives a colony of jellyfish, who have lost their ability to sting, and therefore kill, anything? 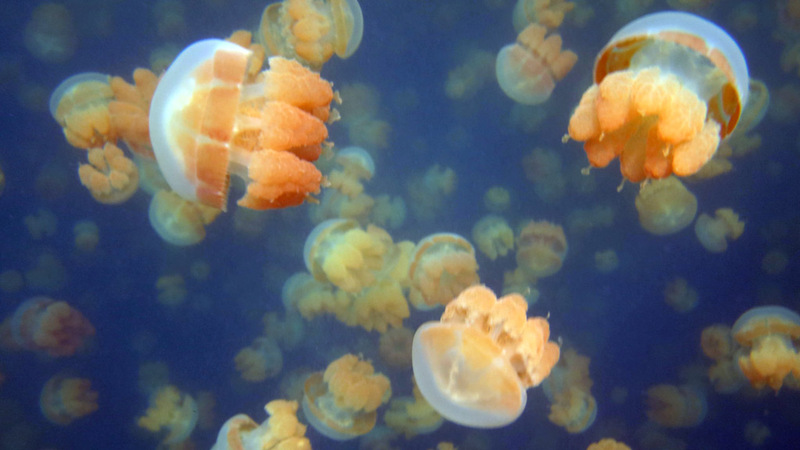 Being jelly FISH – these guys are obviously not living off fresh air. How does that work? Firstly, the reason they are in there is that they got trapped about 12,000 years ago when the sea level had risen to a point where it filled the basin. Now, sea water is only exchanged through a few small tunnels. The top 15m of the lake are oxygenated, whereas the bottom 15 are not, and in between these is a layer containing a dense population of bacteria. 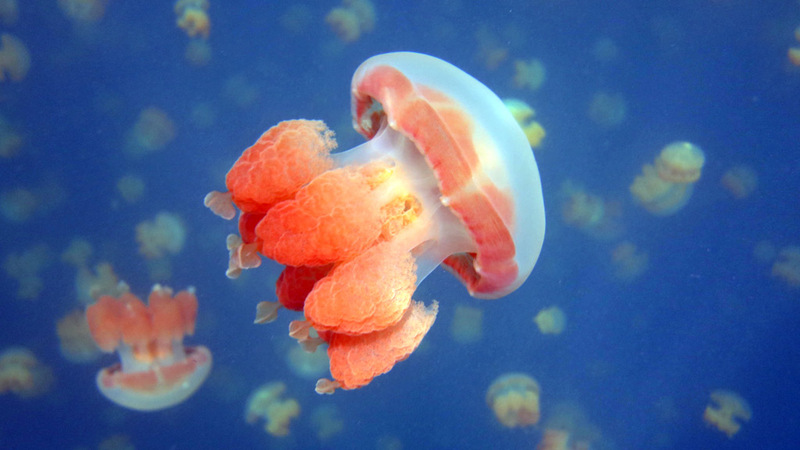 The jellyfish migrate vertically through this layer, and derive part of their nutrition from symbiotic algae that live in their tissues and part of their nutrition from captured zooplankton. So, history and science lesson over, off we troop up the hill – the lake is effectively inside a crater remember – and down the other side to what appears to be your average lake that hasn’t see much freshwater rolling through it – it’s that murky algae-green colour. The lake is already well populated by snorkellers (from countries where swimming is not taught in primary school) wearing colourful life vests and clinging to all manner of flotation devices. I reckon the density of the surface flotsam is probably directly proportional to the density of jellyfish beneath, so I plot a course to navigate around the periphery and approach the central, largest cluster from one side. But as soon as I enter the water I encounter my first specimen. The first thing that strikes you is how magnificently unremarkable they are. They look like a dumbed down version of a jellyfish – eight stumpy legs and a mushroom head. That’s it. No tentacles and practically the same orangey colour all over. What is remarkable is the next one you meet: it’s the same! I mean exactly the same – like it was cloned! And the next and the next and the next. They are all identical except in size. These guys must have the gene pool the size of an egg cup. And so as you progress on from the edge into the cluster on it goes – more and more. As you get towards the centre of the mass the challenge is how to ensure you’re not harming any as you slowly fin through a jellyfish soup. I have to say: it’s well weird in an amusing sort of way. In every direction, and as far as the visibility allows, jellyfish, whole jellyfish, and nothing but jellyfish. Usually you can relate an experience is something else, often a movie, but this is like nothing else. There simply is nothing similar to being in a warm green soup surrounded by millions of harmless orange jellyfish. I tried to estimate the numbers – is the horizontal density the same as the vertical density? I duck dive to see how far they go before the density starts to tail off – but it’s deeper than I can snorkel down – and they are still plentiful. There are probably about 20 in every cubic metre, but how many cubic metres in the central cluster? Hard to estimate. I think Richard and Paul were about right: somewhere between six and 20 million.